Two seasons ago, I discovered grafted tomatoes. 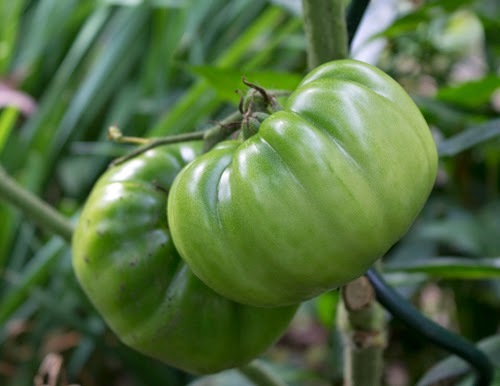 I grew 'Japanese Trifele', a dark-hued beauty with a subtle smoky flavor that was actually developed in Russia, and an early-ripening determinate variety called 'Legend'. I won't be going back to the non-grafted varieties. The thing about grafted tomatoes is that, whatever you decide to grow -- heirloom or modern varieties -- you'll get more yield. But wait. There's more! The variety that performs the root duty (called the rootstock) on the plant is super disease-resistant, providing additional support from disease for the disease-prone heirloom varieties. Learn more about grafting on SuperNaturals Grafted Vegetables' site. In 2013 I grew a grafted 'Pineapple' and a double-grafted plant with 'Sungold' and 'Sweet Million'. Even my father in-law, The Tomato Don of Merrillville, was impressed with the size of the fruit I harvested. The flavor of these tomatoes is enhanced with an extra sweetness, almost melon-like with enough acidity to let you know you're eating a tomato. 'Pineapple' tomato so far this season. Earlier this month I got to meet two of the people behind the tomato grafting movement at the Cultivate '14 trade show and convention in Columbus, OH. Alice Doyle, of Log House Plants, and John Bagnasco of Garden Life now Garden America are two of the three people who collaborated, along with Tim Wada of Plug Connection, to form SuperNaturals Grafted Vegetables, LLC, North America’s largest producer of grafted vegetables for home gardens. John and Alice told me about the challenges of grafting. If the graft plant is larger in diameter than the producing plant, it's nearly impossible to make the graft, so, as they explained, timing is everything. John was happy to hear of my success with 'Pineapple', as that variety can be a slacker in the production department. I'm growing 'Pineapple' again this year, grafted again, naturally. It's currently over six feet tall and has about a dozen fruits on it, many of which are nearing the size of a softball. Also this season, I'm growing a grafted sweet pepper called 'Wonder Bell' that J. W. Jung Seed Company sent me to try. The last time I tried to grow sweet peppers, I think I got two or three puny fruits. Veggies haven't been a priority for me, but I've really started to enjoy having responsibility for my own edibles. 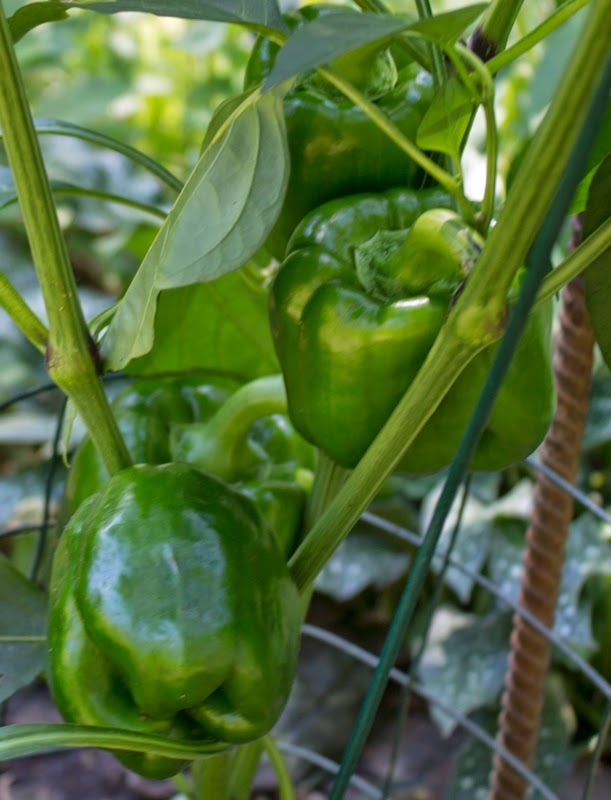 As for the sweet pepper, they're so large already it's tempting to pick a couple. But I'm going to wait til they get bright red and then roast them.